Have you checked out the new Flickr App Garden? 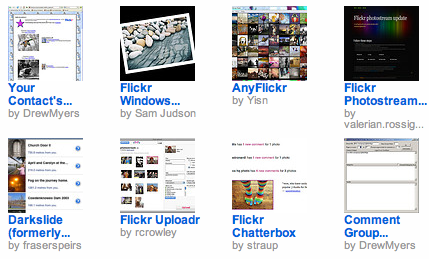 It’s a repository of home grown apps created by Flickr members who used the Flickr API. Actually, some of these apps are not really newly developed apps. You might have seen or used it before with your Flickr photos. What Flickr did is to organized previously available apps, added new ones and organized them in one place to come up with the App Garden. If you have a Flickr account, whether free or pro account and you use Flickr other than as a back-up site for all your photos (like me! ), you’ll enjoy the different apps available at the Flickr App Garden. The site is well organized as well, with featured apps that the Flickr Dev Team suggest at the forefront. You can jump directly to the various apps category using the tag cloud, or check out the suggested apps by the Flickr crew, or if you are a developer or planning to be one, you might also want to check out the Flickr documentation.